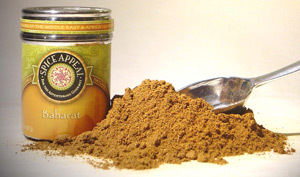 This Middle Eastern blend is an aromatic yet wonderfully spicy mixture of seven spices. This exotic blend is used throughout the Middle East, from Turkey to Morocco to Kuwait. Its magical medley of heat and sweetness creates a pleasant sensation on the palate. Use in lamb stews, ground meat dishes, couscous, and stuffed vegetables. Rub on chicken before roasting. Create a delightful Mediterranean fusion by adding some to Italian or Spanish dishes. Contains allspice, cloves, black pepper, cinnamon, coriander, cumin, and nutmeg.